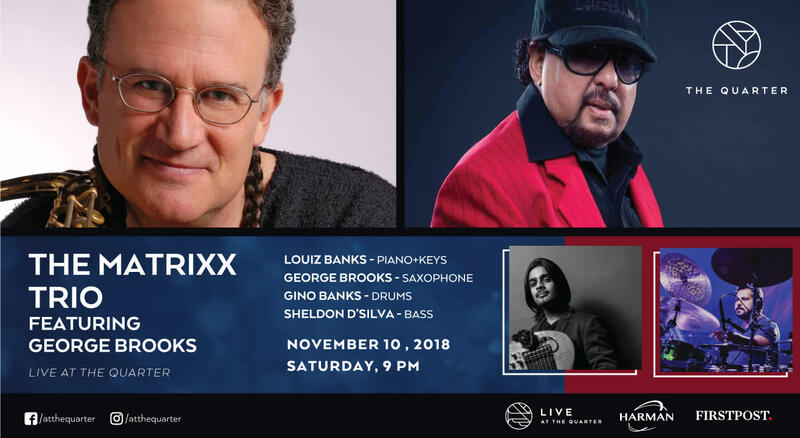 The Godfather of Indian Jazz - Louis Banks will be playing at The Quarter on the 10th of November! It does not get better and grander than this so save the date and make sure you are there! "Louiz Banks has been spearheading the Jazz Movement in India for the past three decades. He has been singularly instrumental in bringing a high standard of Jazz performance for jazz devotees in India. Apart from playing Jazz, he is the most sought after composer for advertising commercials, TV Serials, TV Themes, Curtain Raisers, Anthems Documentaries, Stage Musicals, Film Background scores, popular and Hindi Music. He has proved his calibre, time and again, by performances with greats such as Eddie Henderson, Eddie Daniels, Charlie Mariano, Yolande Bavan, John McLaughlin, Tony Lakatos, Pandit Hariprasad Chaurasia, George Brooks , Wallace Roney , Bob Belden , Roseanna Vitro , Carl Clements, India's best jazz singer Pam Crain, World renowned South Indian Classical Singer Ramamani, World Percussionist Sivamani, Ustad Zakir Husain, Shankar Mahadevan, the eminent Sultan Khan, among others and crowning it all with a tour all over India with the legendary Dizzy Gillespie. When he is not playing music he paints impressionistic canvases in oil and acrylic. - Chubu Music"